Hubby decided to have a potluck party for his club friends today. Rewind to a week ago, he was excitedly telling me who and who will be coming. Unfortunately after that, he left town and only be back this afternoon. So this poor wife (that is me) is wondering besides the Ngoh Hiang and Agar Agar, what dishes will the rest brings? To make matter worst, I had two cakes orders to fulfil this week. Didn't help that the weather had been really wet and for those who works on fondant will know how difficult and stressful it will become for one to work on? Enough said, I am happy that the cakes are out of the house and now I can fully concentrate on getting the party rolling tonight. Now the question still lingers, what will happen if no one is bringing in a main course right? So I decided better safe than sorry. I am going to at least provide main course for my guests. I was contemplating between few dishes and finally decided that it will be easier to cook Dry Mee Siam, considering the short lead time I have on hand. Then again, I needed a reliable recipe so that I will not be a disgrace. I was at wits till S came to the rescue; she forwarded me a Betty Saw's recipe (she had not tried it). Next my kinder friend, GL told me her mom cooks a mean Dry Mee Siam. G's mom is a fantastic cook and looking at her recipe, it is way easier than Betty's as now I am really quite desperate for time. Hubby commented that it tasted good. I shall leave Betty's recipe on another day whereby I am not so short of time to experiment after all I love Mee Siam. Being me, I am afraid that it won't be enough for the guests. So I added on Sambal Udang. Cooking this reminds me of my mother in law's sambal udang. Hers is really good but getting a recipe from her is tough as she cooks by estimation. Even my sister in law can't attain that kind of standard. Well, this still can't beat my mother in law's. I think I will find a time to go to her house with my digital scale one of these days. Next, I wonder whether anyone will be allergy to prawns. Seeing my dad's allergy reaction to prawns last year, now I am very sensitive to who I feed. Verdict: The Dry Chicken Curry recipe that I took from Kitchen Tigress didn't turned out the same from what I saw in her blog. Firstly I had problem stirring in the thick paste with the chicken. So in I added some water, still not very effective and in more water. Actually I wasn't thinking well by then. I should have added coconut milk instead of water. Overall, hubby felt that it is okay, taste wise is more towards Indian curry. Definitely not the kind that I was looking for. So now I have provided the IMPROVED VERSION as below as I was harassed by her and no longer able to post my attempted recipe here. Since my kiddos can't really eat spicy food, I cooked meatballs pasta for them. Thanks S and G's for the recipes! The rain stopped but the haze is still not good but I am going to sit back and enjoy my company. P/S: This shows how deprived we are with spicy food since our last helper left. First blend buah keras, sliced old ginger, shallots and garlic in a food processor until a paste is obtained. Next add meat curry powder and chili powder and mix well with the other ingredient paste. To a mixing bowl, add chopped chicken pieces and curry paste. Add salt at this moment. Rub each piece of chicken with paste until well coated. Leave to marinate for at least 20 min. To cook the dry chicken curry, first add cooking oil into a heated wok. Add marinated chicken pieces into the wok and stir fry until the chicken skin starts to crisp up slightly. Add water, 2-3 tbsp at a time, from the side of the wok and stir-fry until the chicken pieces are nicely cooked but yet still juicy. 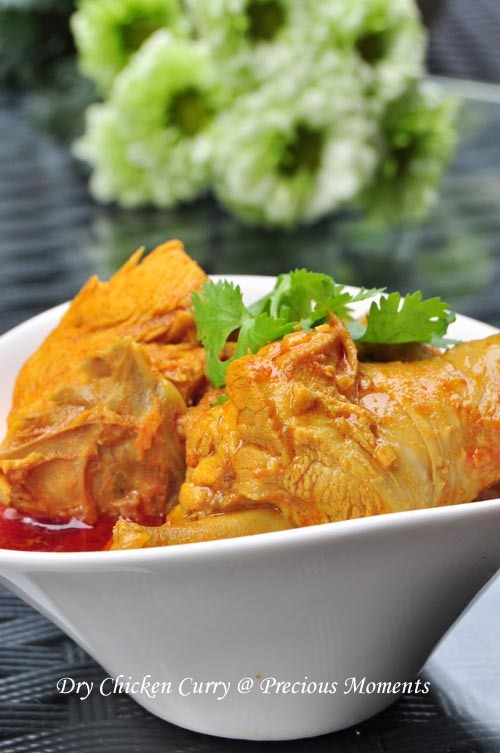 Take care not to add too much water at one go as the sauce should still remain dry and concentrated. It should take around 20-30 min to cook depending on size of chicken pieces and also flame control. Take a piece of chicken and poke with a skewer at the thickest part. The chicken is ready when no blood is oozing out from it. Add curry leaves and stir fry quickly for another 1-2 min for the leaves to release their aroma. Adjust the taste of the thick curry sauce with more salt and sugar if necessary. Skim off the red oil on the top of the sauce if necessary. Dish and serve immediately with rice and other dishes. 50g asam jawa, rubbed in 100ml water, drained to retain asam water only. First, soak the dried chilies in hot water until soften. Remove and discard the seeds and stalks. Chop the red chilies into smaller segments. Retain the seeds if you prefer it more spicy. Using a food processor, grind the rempah ingredients, starting with the hardest, i.e. buah keras, followed by peeled shallots, chopped red chilies, soaked dried chilies and finally toasted belacan powder until a paste is obtained. Remove the shell and intestinal tracts of the prawns. Save the shells for other recipes which require a prawn stock. 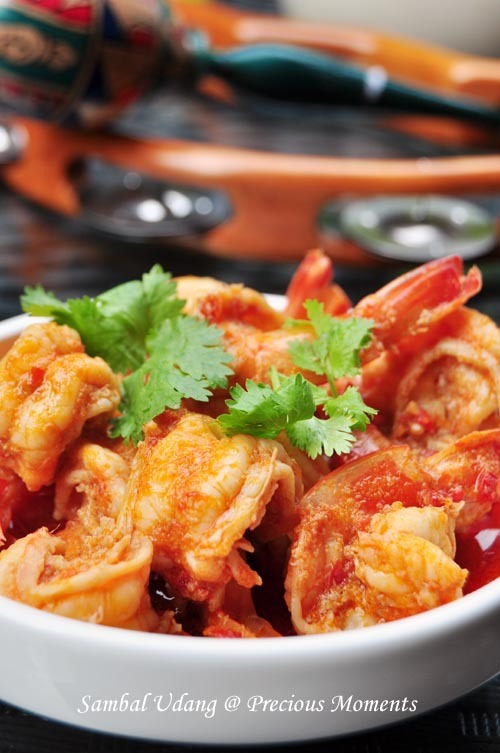 To a heated wok, add cooking oil and fry the prawns until they just turned orange and begin to curl slightly. Do not overcook. Remove the prawns and set aside but keep the oil in the wok. Add blended rempah ingredients and stir fry until the oil begans to separate from the rempah again. Add asam water and simmer until the sauce thickens considerably. Add salt and sugar to season. Return the fried prawns to the cooked rempah and toss them quickly to coat well before dishing onto a plate. Serve immediately with rice and other dishes. I am sure your party is a success with so many delicious dishes you cooked. Looking forward to your recipes. Will do so after this weekend. I have a cake to do tomorrow. Edith, I's sure the party went well. 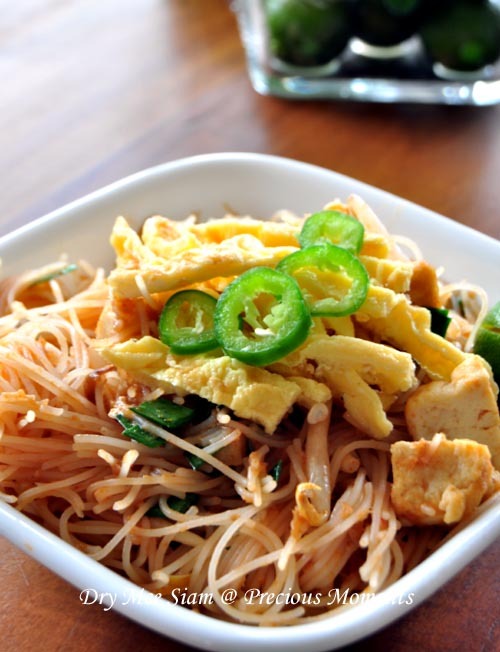 Your mee siam sounds & looks very scrumptious. Same to you too Kristy and thanks. Mel, the curry chicken tasted good the next day. Dumpling Love, Let me ask my friend's mom and see whether it is alright for me to publish. Will get back to you soon. You really know your way to your man's heart :) The food you cooked all sound yummy and delicious. Looking forwards to more recipes! hahahah... I never thought of it this way. Hope will have more recipes to share in future. All the dishes here are so mouth-watering! Love all that spiciness. Edith, I am sure your guests sure enjoy the party and left your house with satisfied tummy, all your food looks so yummy especially dry mee siam which is my top favourite among the 3 :P.
yeah me too, i will go for the mee siam first! i think the curry chicken and sambal prawns are also very delicious to eat with mee siam. as for your question on the yogurt cake, we would prefer to ctick to the recipe we linked but you can modify it. I just made the cake, the three of us, me zoe and joyce have kind of different reviews on the cake, i would think adding a little honey would be nice.